This article is about the race course from Mario Kart Wii. For Rainbow Road as a whole and other versions of the track, see Rainbow Road. 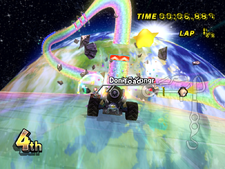 Rainbow Road of Mario Kart Wii is a version of the recurring rainbow-colored track and, once again, the race track is transparent. The track takes place within the Earth's atmosphere and appears to be located over the eastern parts of North America, as well as some parts of Europe, Africa, and South America. If the player happens to fall off in this track, they will burn up in the atmosphere, no matter if there is a section of the course below them, before getting picked up by Lakitu. This course has a Super Mario Galaxy theme to it, and it even includes floating Star Bits and a part of a Super Mario Galaxy musical piece, Good Egg Galaxy's background music. A large galaxy can be seen on the background, plus sunlight on the Earth's surface. This course is also Rosalina's expert staff ghost and normal staff ghost course. The course begins on a near 90 degree slope, located after the starting line. Light drivers are easy to push off in this area, since there are no walls that can help the player from falling off. Three boost panels are present in this slope. One stretches across the road while the other two are spread apart from each other, such as one being on the right while the other boost panel is on the left, (depending on the mode of the race). After the slope is a ramp with a boost panel in it and a sharp turn left. Any vehicle that performs a trick has a risk of falling off on the right end; the worse the drift/handling rating, the more likely the player will fall off. After the first curve are three more boost panels that stretch across the road and a half-pipe ramp on the very right, plus a turn left. The half-pipe contains floating item boxes for the player to use. After the left turn is a slightly wavy road, which the player may perform tricks on. Each lap, the road gets wavier, allowing for more tricks to be performed. After the wavy part is a ramp with a boost panel on it, for the player to speed up and perform a trick. The player will then see two giant holes that make a shape of the number eight. These holes will cause the player to fall. Half-pipe ramps are located to the left and right of these holes, and the player may perform a trick on the edges of these holes, since the edges of these holes contain small ramps. Both holes contain half-pipe ramps, but the latter one does not have any item boxes on top of it. After this area is a turn left, then a curve right that has item boxes lying across the road. After the item boxes is a Launch Star, which leads the player at very high speeds to the other part of the course. When the player gets out of the Launch Star, there is a very minor twist in the road and a half-pipe ramp that leads into another section of the track, making a broad turn right for the player. After this particular ramp are two roads, which split and then merge later on in the track. Both will make the player end up in the same area, but one to the right is more elevated than the other and has boost pads in different locations. Both will lead to a ramp with two boost panels on it, with floating item boxes. Past the ramp is where the road merges again. This part has more boost panels with a sharp curve to the left and to the right. The boost panels may give the player an edge or throw the player off course and off the track. Past this area is the finish line, which starts the track over for another lap. It is the longest Nitro Course, and the second largest track in the game. At the beginning, racers can use a mushroom or slipstream in conjunction with a jump to fly over the beginning ramp and land just before the boost ramp. The November 2009 second tournament took place at Rainbow Road. Players had to race three laps, while avoiding the Chain Chomps and Incoming Chomps. The players started the race with a set of Triple Mushrooms. The official description stated, "Anticipating their movements and avoiding them is the key to a good score." This could be a reference to the Mario Kart 64 track, as Chomps were present there. The tournament was restricted to karts only. This tournament was repeated as the first tournament of December 2010, but without restrictions. It was later repeated as the second tournament of August 2011, and the first tournament of November 2012, with the karts only restriction intact for the August 2011 tournament. Official European website: "Don't get caught stargazing as you power round the multicoloured Rainbow Road. The multiple speed boosts could hurry you along to the finish line or over the edge to your demise. Remember; don't look down!" Trading card description: "The layout of Rainbow Road has changed over the years as it has appeared in a variety of incarnations; the challenge factor has always been high. It's a long track with plenty of opportunities to fall off into space. In Mario Kart Wii, at least one of those opportunities can become a shortcut if you play it right." A remix of this course's music appears as one of the selectable songs in Mario & Sonic at the Sochi 2014 Olympic Winter Games. The music also uses the opening portion of Rainbow Road's music from Mario Kart DS. Both the normal and expert staff ghost of this course make appearances as staff ghosts in Mario Kart 7. The normal ghost, Nin*Konno, appears as the normal staff ghost for DS Luigi's Mansion, while the expert staff ghost, Nin*syun1, appears as the expert staff ghost for Wario Shipyard. This page was last edited on March 26, 2019, at 10:57.